People often dream about touching the sky with their own hands, but unfortunately, not many of them try to make their dream a reality. We offer you the opportunity to live out this dream. 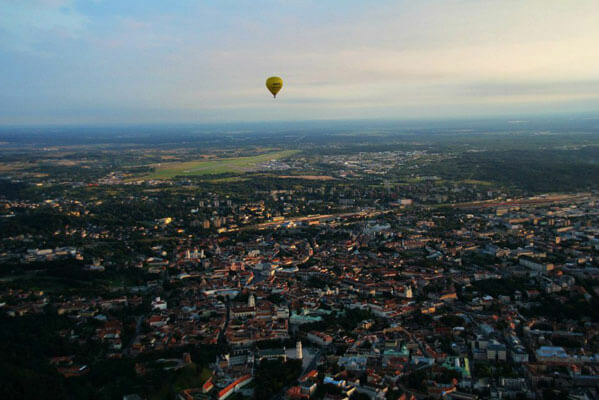 Our hot air balloon flight in Tallinn will take you on a truly magical and unforgettable trip! You will surely remember your first flight for the rest of your life. Ballooning is a completely new and wonderful world where you can enjoy the breathtaking views and have an unforgettable experience. It is not only a splendid trip, but also it can become an outstanding gift for your family members, friends, and even business partners. Moreover, you can make a great surprise for your soulmate and take him/her on a romantic journey in the sky! Feel the absolute freedom of a balloon ride in Tallinn. It does not matter! You can book a flight any day and all year round, even in winter. The only condition is that wind velocity is not exceeding 5m/s and there is no thunderstorm. Flights are set early in the morning or 3 hours before sunset. We assure that you will not be disappointed! First, contact us by the phone or e-mail. Leave us your contact phone number or e-mail. After you get the confirmation of your flight, we will send you the payment information. In case of delaying or cancelling of the flight, we guarantee you a full refund. Be sure to remember the Payment Number that you were given. Come to the agreed place at the agreed time and join us! Minimum – just relax and let the wind handle everything else! It fully depends on your wish! Usually we fly in Keila, Tartu, and Pärnu. Prices and duration are for flight from Keila. (30 km from Tallinn). Prices vary from other take-off points.